This is the second hat I've ever knit (I knit my first one a month ago, but I've yet to photograph it). This was THE perfect project, quick to knit (it took me one evening), easy to follow the instructions (wait until I show you that tricky first hat! ), and it is super cozy without being scratchy (I'm just learning this is a big deal when knitting for children). I'm not sure if we'll keep this one or add it to the scarves I'm making for the silent auction for my sons' school. Either way, I'll definately be making this one again. I was a knit and crochet maniac in November/December, but failed to photo or post most of my projects before they went to their new owners...you know how it is. Here's where I left off on my scarf making. I've moved into the world of cowls. It was this free pattern from Lion Brand that got my attention...something about the texture that I really loved. I'm not an experienced crocheter but I settled into this simple single crochet, double crochet rhythm quite easily. The pink one shown here is the fourth one I made...I sold several at my Preschool Holiday Fair in November. Oddly enough, the green one in this photo IS quite scratchy and not fun to wear...how does that work? It's the exact same blend. Oh well. I'm thinking of maybe lining it with fleece but am not quite sure how that would work out. This time using a lovely wool/silk blend from Noro that is so lovely to work with. And just look at the texture. Up next: I'm trying to squeeze in more scarf making for a silent auction fundraiser at my son's school and thought this would make a pretty scarf. It's been over a month since I've last made a mosaic and I've been debating whether I want to continue with mosaic monday posts here. I still enjoy peeking around flickr seeing what new things are being created though, so who knows. The images never cease to inspire. I've been daydreaming about knitting or crocheting a blanket...probably due to my new love of little dandelion. I can not get those beautiful throws and blankets out of my mind. Vacation is officially over for me today as it's time to open the preschool again this morning. Last month at the preschool we made glass bead icicles. Each child selected their beads and got a piece of fish line with a knot in the end to string them on. I also gave each child a square of wool to set their beads on so they would not roll all over the place. Once they were satisified with how their icicle looked, I tied the top with a loop for hanging. This was a great exercise in using those fine motor skills. Most of the children were excited to hang them on their trees at home and they also look quite fetching hanging in the window where they can catch the winter light. 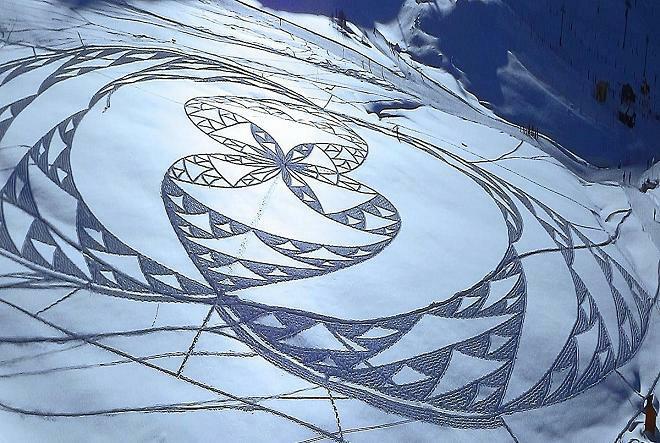 Have you seen Simon Beck's snow art? 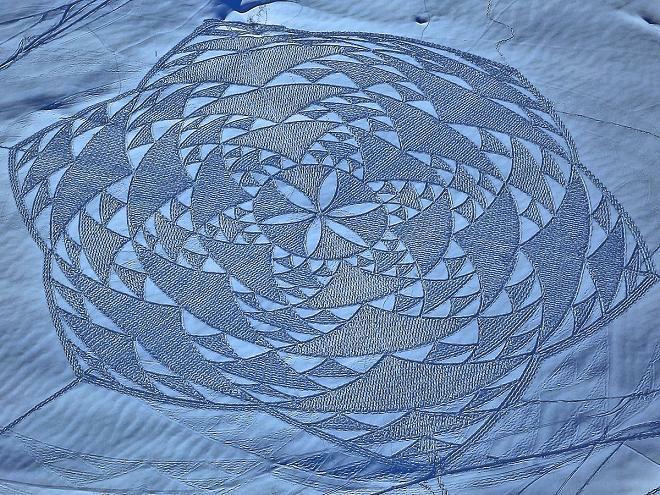 They look like quilts in the snow. He creates these spectacular designs in France by stomping through the snow for hours wearing snowshoes. Sounds like a good workout to me! So inspiring. How appropriate that I should wake today to find that my gift from Lulu (a dear little three-year-old from my preschool) has bloomed. The narcissus is symbolic of rebirth, new beginnings...which I'll just interpret as a clean slate...a fresh start to the New Year. Plans, ideas, dreams, goals are all swimming through my head. It's exciting to think of all the possibilities that a new year can bring.